The Association continued its fight against further regulation of PM2.5 emissions from agricultural operations testifying before the San Joaquin Valley Air Pollution Control District today at the District workshop on the PM2.5 State Implementation. Association President/CEO Roger Isom testified against the mandatory replace of all tractors and harvesters, despite an individual alleging to be an almond grower telling the District that every grower should be mandated to purchase new low emitting almond harvesting equipment. 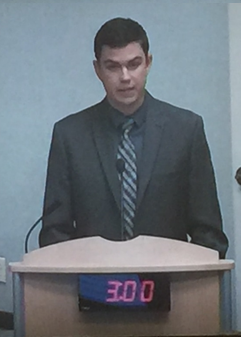 Instead, Association Director of Technical Services Christopher McGlothlin testified that incentives have been used to get equal or greater emission reductions on a voluntary basis. McGlothlin also commented that incentives allow farmers to purchase new equipment sooner then they normally would and the industry is working with the District and USDA NRCS to strengthen and support the incentive program for tractors and harvesters. Isom also commented against the proposal to increase fugitive dust requirements for PM2.5, as the science does not support this. This is another in a series of SJVAPCD and CARB workshops, including two more to be held next week. As has been the case in all of the previous workshops the Association will be present to fight these proposed far reaching regulations. This entry was posted in NEWS & ISSUES on May 9, 2017 by ccgga.